The Rundown: Into the Night is rapidly becoming one of Melbourne, Australia’s favorite Rock bands. Made up of guitarists Benjamin and Warren, drummer Jules, Andy who plays keys, Lee the bassist, and Pat the lead singer, Into the Night have a rich Metal/Rock sound that will blow you away. When I say Metal I’m not talking about the Screamo crazy-loud, hurts your ears type of Metal. Into the Night are perhaps a little like, dare I even utter the name on this site… Metallica. And not the stupid, crappy, sell-out, record-company-drones Metallica. The pre-Napster good Metallica. Already gaining massive attention in Australia, in 2010 the band released a 13 track, self-titled album that was made with a little help from some people who have very successful backgrounds. Rich Veltrop and Sylvia Massy have worked with some pretty well-know bands like Rage Against the Machine, Tool, Smashing Pumpkins, Johnny Cash, and the Red Hot Chili Peppers. Those bands ended up doing pretty well, to say the least. I would be willing to bet Into the Night will become a very well-known band in the not too distant future. Into the Night knows how to Rock out. They can create some Hard Rocking Metal music as in their song You Won’t Know. They are also able to turn it down a notch while still managing to create some melodius, rock-your-socks-off tunes like in their song The Game. Pat’s voice is impeccable, and seems to fit the music very well, accentuating the sound the band blasts out. At times his voice becomes another instrument making the band ever more dynamic. If you check out Into the Night’s website (which I strongly suggest you do because it is super-cool) you will be able to read a little something about each member of the band. When I read what showed up for Pat, I instantly realized how cool this band is. That writing seems like it would be the perfect preamble for a revolution. The band appears to have a good sense of humor and to be all around good guys. 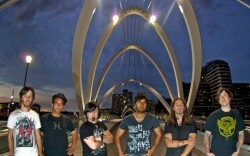 MarsBands.com loves the music that Into the Night is making, and we suggest you check them out.